Sometimes positive dog training is in the form of an insult as in, “Them positive dog trainers with their clickers and their treats don’t understand what it is like to train a really dominant dog”, or “if I use a reward* for training, my dog will only obey when I have it with me”. Often it is used by the proponents of the dominance theory of dog training who say “my dog shall obey me simply out of respect for me” or who like physical prompting (e.g. dragging the dog around on the leash, digs in the dog’s ribs, hold downs, alpha rolls, etc.) to “show the dog who is the boss”. Well, there are two sides to every coin. And again I refer to our buddies’ ancestors, the wolves. They communicate in a way that makes it clear to every wolf if he actually gets rewarded or punished – without physical prompting. I work with positive reinforcement, but I also punish dogs. I decide whether I want to give my dog a treat or not. Every time I click I may also not click. If my pup is expecting a click or a treat and I do not fulfill that expectation I punish him. Taking away a reward is negative punishment and can be an extremely effective way of not only changing behavior in dogs, but also of communication. 1. 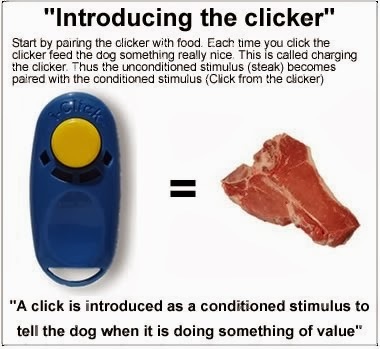 Sit facing your dog and place a very tasty treat on the palm of your hand. 2. A pushy dog tries to grab it. If your buddy does; close your hand. Now you are communicating with your pup and you are punishing him. 3. Depending on the stamina of your dog there will be a smaller or a bigger number of attempts; be patient! 4. Eventually he pauses to think; preferably he will look into your eyes. Immediately use this pause and reward it by popping the treat into your buddy’s mouth; now you are positively reinforcing your dog’s behavior. 5. Start again. Be patient! As the penny drops, your dog learns that backing off is better than grabbing. In the beginning you will be more punishing than rewarding, but you are not physically prompting. This type of training is called “Behavior Capturing”. Keep in mind our graphic, “How do dogs learn”! Standing still to teach no pulling on the lead? Punishment. Continuing the walk when the dog came back in heel position? Positive reinforcement. Saying “No” when a piece of onion drops on the floor to stop them from eating it? Punishment. Giving them one of their own treats for not eating the onion? Positive reinforcement. Teaching them that they can earn rewards for doing the right thing, has the consequence that when they do the wrong thing these opportunities disappear. I love my dogs. I am lucky, having a happy, healthy relationship with them, an inherent bond, based on mutual trust. Rules are necessary, consistency is vital, and firmness may be in some cases appropriate. Brutality, as described above, is not. This is, what I call positive dog training. *Reward: A reward does not need to be a treat. It can be affection, a pat, a toy, or a tug game. But it is essential that you know, what kind exactly is a reward for your dog.